These settings are for users that have mobile capabilities on their account. Some of this may seem redundant, but mobile settings are treated differently than other settings for your account. You should NOT enable Store & Forward unless you were advised to do so by your merchant account provider. This option changes the way transaction data is sent. It is useful for times when an internet connection goes down, and you must process transactions offline. 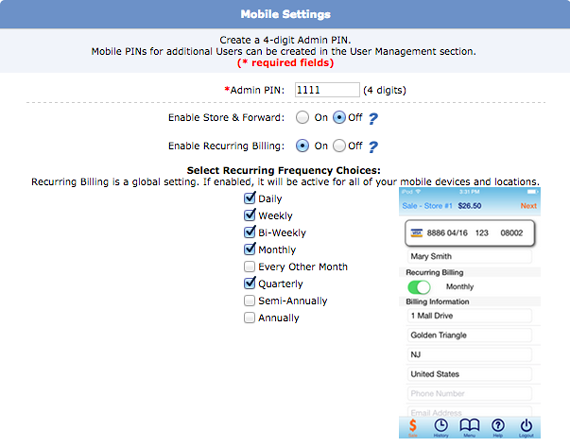 Enable Recurring Billing if you'd like to allow users to enter a payment once, and have it recur multiple times. You can also select which Recurring Frequency Choices are available. The receipt settings in this section apply only to transactions created in the 1stPayMobile app. Just like the Transaction Center's receipt settings, these are required for transactions to run successfully! These options can be used to make running transactions on our 1stPayMobile app more convenient. If Sales Tax is enabled, you will be asked to enter the default sales tax rate. The ability to have more than one sales tax rate will be available in an upcoming software update. Memo field is for quickly making notes about a transaction. The 'Memo field label' determines what the name of the field will show up as (like names for Additional Fields). If the Tip option is enabled, a default tip percentage can be selected. This will automatically be added into transaction totals. Note: If Tip is enabled, the Tip buttons will display on the signature screen. The customer can choose to keep the default tip percentage, select another tip percentage, select "No Tip", or enter a custom tip amount by dollar amount or percentage. If 'No Signature (25.00 or less)' is turned on, then smaller orders won't prompt for a signature. This will affect what cardholder information will be used for mobile transactions. 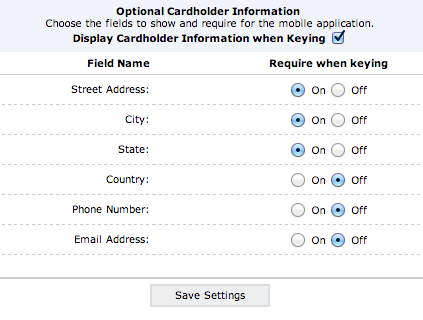 'Display Cardholder Information when Swiping (Keying)' is what determines whether or not billing information for the card can be entered. If neither of these are checked off, only the card number, name on card, expiration, and security code can be entered. Additionally, if 'require when swiping (keying)' is set to off for a field, it will always be optional. Activated Devices displays the devices that have been activated for the account you are signed into. You may disable a device (if it is stolen or used by an individual who shouldn't have access to the account) or delete it if you no longer wish to have that device activated. Removing activation for an active device will require it to be activated again!